A working meeting of Alexey Miller, Chairman of the Gazprom Management Committee, with heads of leading Russian pipe companies and the Pipe Producers Association took place in Moscow on 30 November. 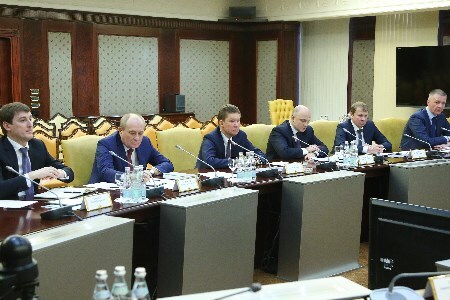 The meeting was attended by Anatoly Sedykh, Chairman of the Management Board of United Metallurgical Company (OMK), Dmitry Goroshkov, Marketing Director of Severstal Management, Dmitry Pumpyansky, Chairman of the Board of Directors of TMK, Andrey Komarov, Chairman of the Board of Directors of Chelyabinsk Pipe Rolling Plant, and Ivan Shabalov, Vice President and Co-ordinating Council Chairman of the Pipe Producers Association. The meeting addressed joint efforts made by the parties during the implementation of Gazprom’s strategic projects, including the supplies of pipe products for the construction of the Power of Siberia gas pipeline and the development of gas transmission capacities in northwestern Russia. Particular attention was paid to the pipe companies’ current objectives related to introducing new types of products by, inter alia, developing pipes, equipment, and structural materials for natural gas liquefaction and offshore development projects.